The bedroom is quite possibly the room that we spend most time in. Whether we are sleeping, getting ready for work, folding laundry, or reading a book, this space is at the center of our everyday lives. It is the room we return to continuously to be refreshed, get prepared, or flat out relax at the end of the day, and why wouldn’t we want to be able to adjust our lighting accordingly in such an important space? There a many opportunities to utilize a variety of light sources in the bedroom so that the combinations are endless and can be adjusted to your mood or needs. 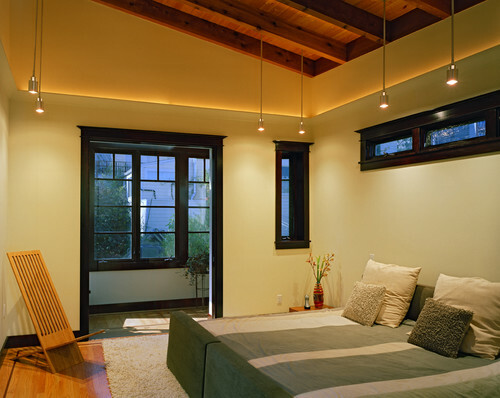 Layered lighting in the bedroom is a trend that is on the rise, and for a good reason. We do not like to feel that we are restricted by any means in our life, but most importantly, in the comfort of our home. We should have complete control of this space and be able to fine tune it to each each moment throughout our day. There are three main ways of brightening our interiors and they are ambient, task, and accent lighting. We want to share more about these different ways we can light our bedroom, and then show you some fabulous examples of how each can transform your space and give you the ability to change the mood with the flick of a switch. This is your main source of lighting in your space. 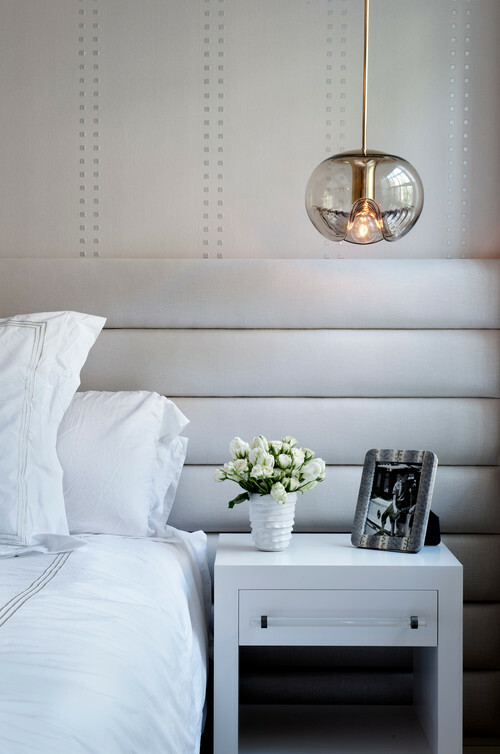 Being the most important fixture in the bedroom, you want to choose something that is both aesthetically pleasing but also efficient in lighting your space. Often ceiling fans with light kits are used to acquire a lighting and cooling source in one fixture. There are many different styles of fans making it easy to find one that will pair flawlessly with your design. 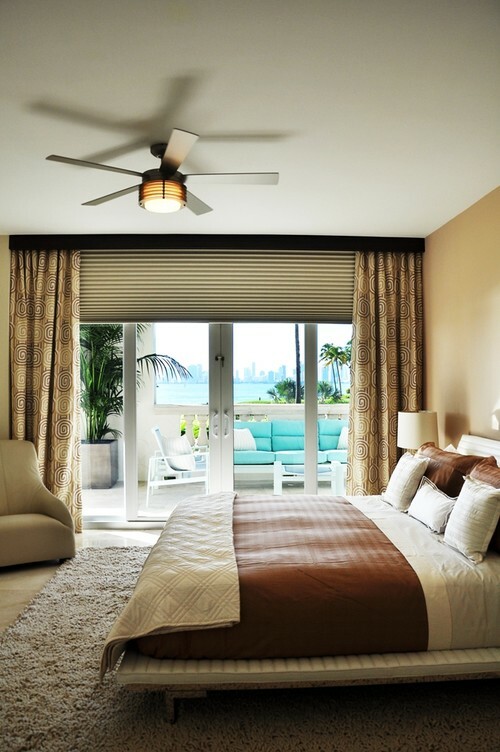 For many, a fan is necessary to get a good night of sleep, or they simply live in a hotter climate, which is why this is such a go-to choice for its versatility and efficiency. Although, sometimes the light kit just doesn’t give off enough light, so in many cases they will turn to recess can lighting to make sure the room is fully illuminated. On the other hand, many homeowners with taller ceilings in their bedroom will turn to statement lighting to create a focal point in their overall design. Statement fixtures can come in many forms but in the end they will all add elements of style and confidence to the space. Choose from large pendants, elaborate chandeliers, or stylish lanterns for a unique fixture to balance the tall ceilings with the rest of the room. This is exactly what it sounds like: the light sources that serve a purpose or are used to illuminate necessary spaces in the bedroom. 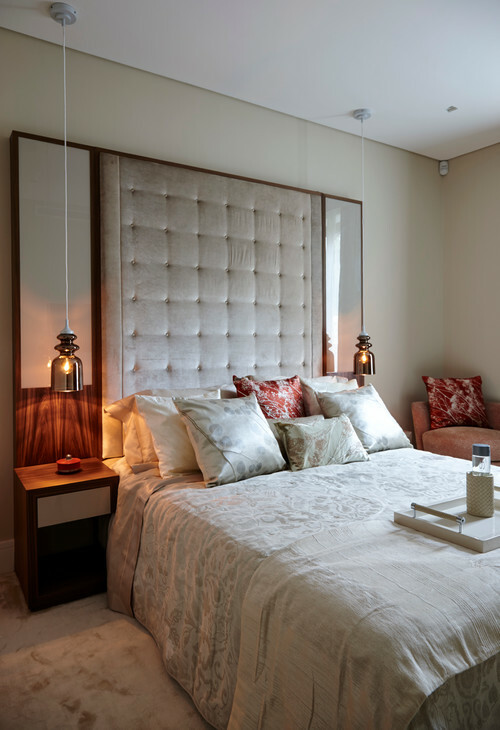 Your bedside lamps or pendants fall into this category and are more important than you may think. 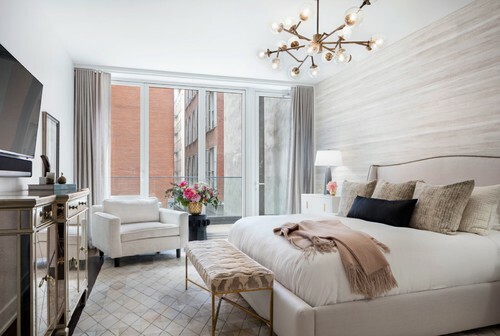 Whether you’re reading a book, or just need to take the lighting down a notch for the evening, these key light sources will surely make all the difference in your bedroom design. You may also consider a multi-functional desk lamp for your workspace or a floor lamp if you have a seating area incorporated into your bedroom. Here are a few designs that took to their task lighting options to add character and zest in their styled space. Not to mention, there are many opportunities to bring beautiful sconces into unexpected spaces like this bay window seating in this bedroom. Talk about tres chic! 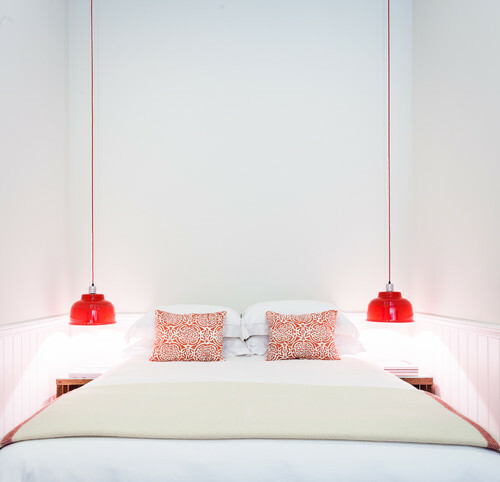 Finally we arrive at the purely decorative option for lighting our bedroom: accent lighting. Whether your design needs twinkle lights, led rope to accent the trim, or illumination in your in-unit shelving, you can use these fixtures to help add ambiance and classiness to your space while accentuating the entire design of the room. Accent lighting is meant to be beautiful and creative, so think outside the box and give a touch of personality with some unique pieces. Check out our blog on LED lights and art lighting for more information on different accent lighting options. Once you’ve successfully brought in several layers of lighting, you may begin to experiment with the different combinations and what kind of mood or purpose they fulfill. To add even more possibilities to this new-found plethora of options, throw some dimmers into the mix or a warmth-flexible LED light bulb to expand your horizon to the full spectrum of cool and warm lighting. These new bulbs actually allow you to adjust the warmth of the lighting to pair with the time of day: cooler by day and warmer by night. Pretty cool, huh? 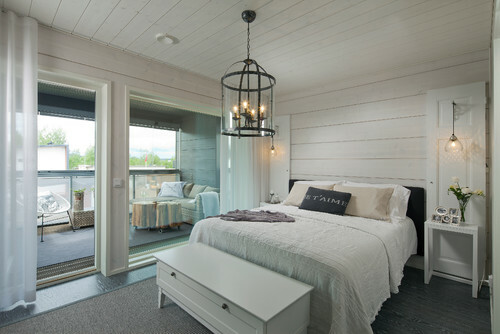 In the comments below, tell us what’s lacking in your bedroom lighting and if any of these options seem tempting or necessary in your bedroom design. Also, we love to see pictures of your beautiful designs and hope that you’ll share one or two with us so that we can continue to be inspired by all you creative homeowners and designers. Follow us on Facebook, Instagram, Twitter, Pinterest, and Houzz for interior design inspiration and valuable information. We love to hear about your projects whether you’re remodeling or building from the ground up.